Another capture of the bluebonnets farmhouse in Marble Falls in the Texas Hill Country. 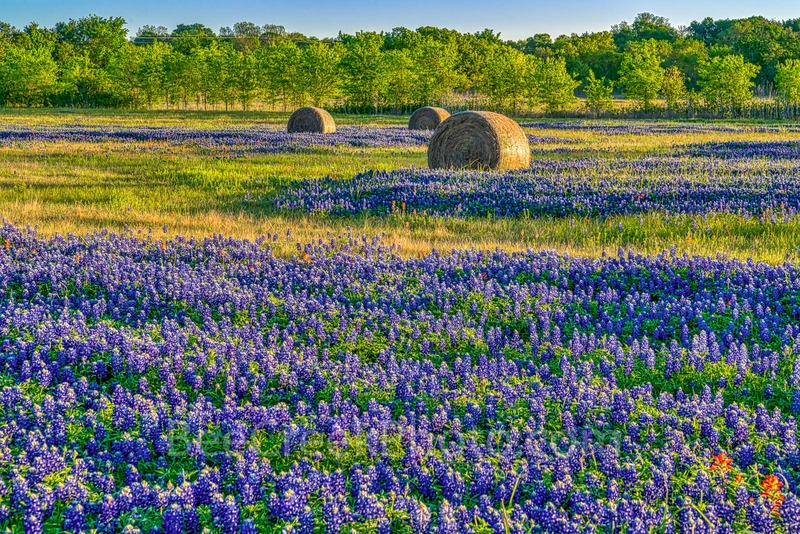 The Texas lupine or bluebonnet is one of the most popular things to see in the spring time in Texas. People come from all over to enjoy these colorful wildflowers. However ever year is not the bumper crop we expect some year depending on the amount of rain we get in the fall determines what we get in the spring. We have seen bumper crops of wildflowers some year which have been beyond our expectations other years not so much. 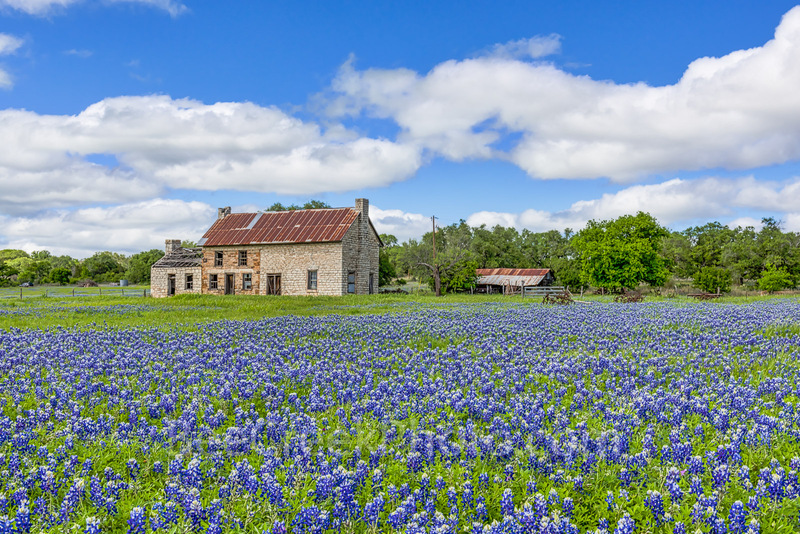 I wanted to post this image because I have reason to believe this might be the last year we will see bluebonnets at this old farmhouse. This place has drawn photographers from all around both amature and pros to this spot because of it uniqeness with the old farm house and rusting farm equipment place just so in the front of the place. In 1971 the Texas Legislature declare all bluebonnets in the state to be the state flower. Also around this time Lady Bird Johnson had help push the Texas Highway Beautification Act so that we would continue to see all these wonderful wildflowers along our roads and highways. Thats what make springtime in the Hill country special. Another capture of the bluebonnet farm house in the Texas Hill Country from a lower angle. This seems to be an endless field of bluebonnets up to the house and then these wonderful blue skies with puffy white cloud. We have taken a lot of photos of this house in the Hill country but today we have these nice skies brought us back for another visit. This was the last year we will see bluebonnets from here so wanted to make sure we got them out. Posted in Photo of the Day and tagged blue bells, blue sky, bluebonnet, Bluebonnet Farmhouse, bluebonnets, bluebonnets at the farmhouse, delapidated, farm equipment, Farm house, Lady Bird Johnson, lupine, Marble Falls, rusty, spring, springtime, texas, Texas Hill Country, wildflower, wildflowers on April 16, 2018 April 16, 2018 by Bee Creek Photo. 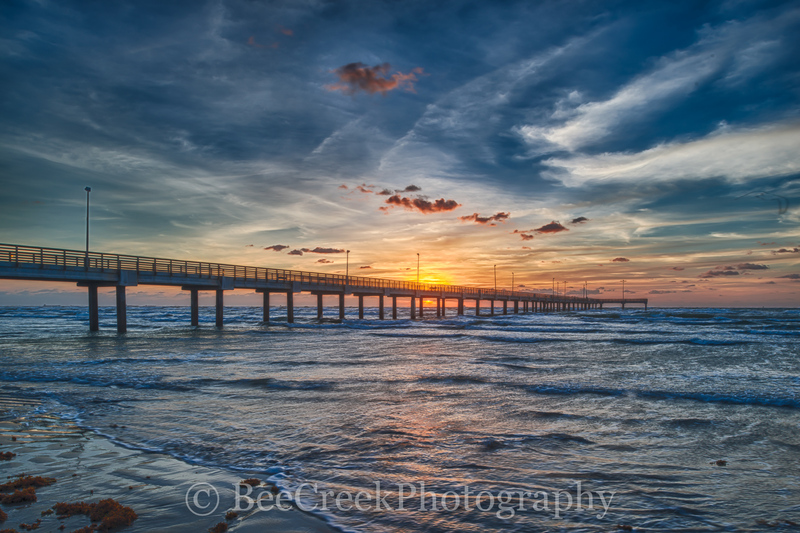 Captured this stunning Texas coastal sunrise as it was coming up under the Caldwell fishing pier at Port Aransas sea shore as we walked along the beach early morning. You never know what the surf will bring in and today we found some red sea weed on to the beach with the tide from the night before. This texas sunrise landscape with the nice waves and wonderful colorful sky is a great way to view the beach. This is a favorite vacation spot on the texas beach where many come tourist and texans come to enjoy what it has to offer. This laid back community is always fun with it many fishing, swimming, bird watching,opportunities along with many other things to do. Captured this sunrise as it was coming up under the fishing pier at Port Aransas sea shore as we walked along the beach where the surf brought in some red sea weed on to the beach with the tide from the night before. This is the Caldwell pier along the Texas coast, a favorite for locals and tourist to enjoy this little piece of paradise. The summer brings all kinds of water activities like swimming, surfing, sailing, boating, fishing, etc. Posted in Travels and tagged beach, coast, coastal, coastal landscapes, colorful, fishing pier, gulf of mexico, landscape, landscapes, ocean, pier, Port A, Port Aransas, scene, scenic, sea weed, seascape, sky, sunrise, surf, Texas beach, texas coast, Texas coastal sunrise, tourism, travel, vacation, water, waves, wet sand on April 16, 2018 by Bee Creek Photo. Bluebonnets with mesquite makes for a very Texas Hill Country look since ever spring wildflowers bloom among the mesquite and cactus. Theres a reason they are so special even our Legislature felt the need to declare the bluebonnet or Lupine the state flower of texas. In this image we were able to capture the sun rays through the mesquite tree over this field of bluebonnet wildflowers in the Texas Hill Country for a scenic landscape. The Texas bluebonnet or lupine were declared the state flower by the Texas legislature in 1971 that along with the Lady Bird Johnson Highway Beautification Act have helped the wildflowers in the southwestern United State become a favorite thing to see every spring. People come from all over to see them and enjoy these wonderful wildflowers. It has become a ritural to search for these wonderful field of flowers every spring. Many bring their children, their dogs, their favorite items to put in the wildflowers to be photographed. We have seen boots, high heels, cowboy hats and stuffed toys. Bluebonnet Star Burst Sunset – Bluebonnets are the most photographed wildflower in the Texas Hill Country. Theres a reason they are so special even our Legislature felt the need to declare the bluebonnet or Lupine the state flower of texas. 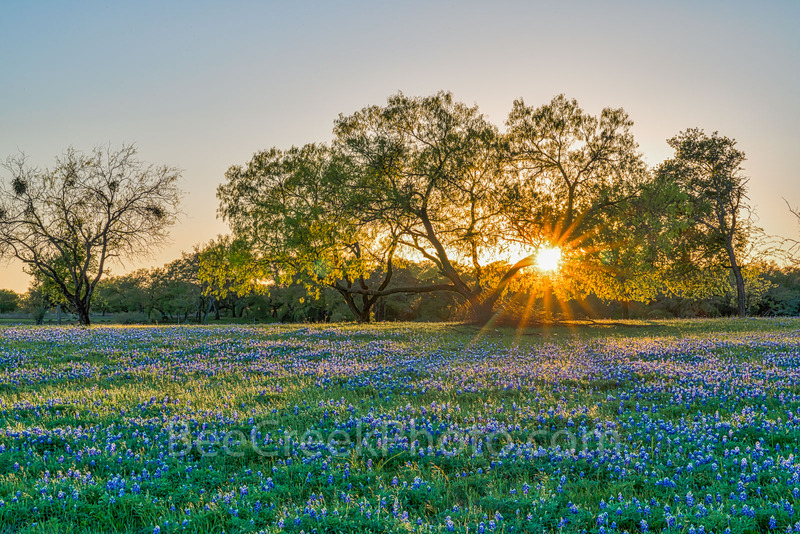 In this image we were able to capture the sun rays through the mesquite tree over this field of bluebonnet wildflowers in the Texas Hill Country for a scenic landscape. The Texas bluebonnet or lupine were declared the state flower by the Texas legislature in 1971 that along with the Lady Bird Johnson Highway Beautification Act have helped the wildflowers in the southwestern United State become a favorite thing to see every spring. People come from all over to see them and enjoy these wonderful wildflowers. Posted in Photo of the Day and tagged bluebonnet field, bluebonnets, Highway Beautification Act, Lady Bird Johnson, legislature, lupine, mesquite, photographed, rays, state flower, sunset, texas, Texas Hill Country, wildflowers on April 14, 2018 January 14, 2019 by Bee Creek Photo. Bluebonnet sunrise along the river just as the sun ray pop over the horizon to wish us good morning. The Texas bluebonnet is the most popular wildflower as people come from long way off just to see them. I have met people who traveled from California who came to see the bluebonnets here. Of course not all years are great it has to do with the fall rains not enough and these hardy plants may not show their best, but just wait a year and maybe the next year will do it. In any case the Texas bluebonnet is still the most popular wildflower people have festival for them, name their towns as the bluebonnet capital so who are we to question them. We loved the tranquility of this image with the sunrise over the water and a nice field of bluebonnets with a tents along the river edge. Spring time in the Texas hill country can be magicali f your in the right place and it bluebonnet season. Lady Bird started this with her Highway Beautification Act and we are so happy she did! Blue Bonnet Sunrise Along the River – Bluebonnet along the river at sunrise just as the sun ray pop over the horizon. The Texas bluebonnet is very popular wildflower as people come from long way off just to see them. I have met people who traveled from California who came to see the bluebonnets. Of course not all years are great it has to do with the fall rains not enough and these hardy plants may not show their best, but just wait a year and maybe the next year will do it. In any case the Texas bluebonnet is still the most popular wildflower people have festival for them, name their towns as the bluebonnet capital so who are we to question them. 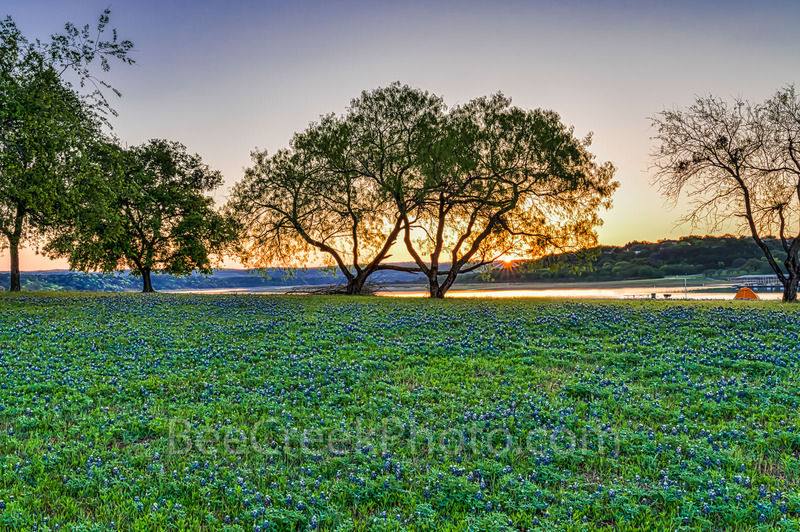 We loved the tranquility of this image with the sunrise over the water and a nice field of bluebonnets with a couple of tents along the river edge. Spring time in the Texas hill country can be magicali f your in the right place and it bluebonnet season. Lady Bird started this with her Highway Beautification Act and we are so happy she did! Posted in Photo of the Day and tagged bluebonnets, field of bluebonnets, Highway Beautification Act, Lady Bird, lifestyle, river, springtime, sun rays, sunrise, tents, Texas Hill Country, travel, water, wildflower on April 13, 2018 January 14, 2019 by Bee Creek Photo. We capture this New Orleans skyline in downtown area around dusk as the high rise building light came on and it created this nice reflections in the Mississippi River. There was stil a little color in the sky from the sunset just enough to gve it some pop over the cityscape with some oranges and pinks mingle with the dark clouds. This New Orlean skyline pano was taken from across the Mississippi River at dusk. The view of the city high rise buildings along the shore line makes for a nice image as the building reflect in the water shortly after sunset. New Orleans is the largest city in the state of Louisiana population of around 1.5 million people. The city attract tourist from all over the world with its many popular neighborhoods such as the famous French Quarters, Jackson Square and many more area of interest. Beside Bourbon street and french quarter there are plenty of wonderful restaurants in the area. New Orleans also has a lot of things to do such as World War Museum, Art Museums, Aquarium, or even a visit to the city cementaries, plus you can enjoy a visit to the Superdome home of the New Orleans Saints. There are riverboats rides along the Mississippi River just some of the thing available to do in the city. Not to mention the wonderful architecture you see through out the city. New Orleans Skyline Pano – This is the New Orlean skyline pano which was taken from across the Mississippi River at dusk. The view of the city high rise buildings along the shore line makes for a nice image as the building reflect in the water shortly after sunset. New Orleans is the largest city in the state of Louisiana population of around 1.5 million people. The city attract tourist from all over the world with its many popular neighborhoods such as the famous French Quarters, Jackson Square and many more area of interest. Beside Bourbon street and french quarter there are plenty of wonderful restaurants in the area. New Orleans also has a lot of things to do such as World War Museum, Art Museums, Aquarium, or even a visit to the city cementaries, plus you can enjoy a visit to the Superdome home of the New Orleans Saints. There are riverboats rides along the Mississippi River just some of the thing available to do in the city. In any case this is one of the few images of the New Orleans skyline pano we were able to capture in our short visit. Posted in Travels and tagged buildings, city, cityscape, cityscapes, color, colors, downtown, dusk, high rise, Jackson square, Mississippi, New Orleans, orange, pano, panorama, pinks, river, shoreline, sky, skyline, skylines, sun set, tourist, travel, water on April 6, 2018 September 25, 2018 by Bee Creek Photo. A Texas sunrise just before the sun pop over the nearby mountains from this vantage point in Santa Elena Canyon in Big Bend National Park. Even before sunrise it rewarded me with these beautiful colorful clouds over the Rio Grande landscape from my vantage point high in the Santa Elena Canyon. Another good capture of some great Texas landscape scenery. Big Bend is an isolated area and for us it is an eight hour drive just to get there but it has always rewarded us with some magical scenery. Big Bend National Park is located in southwest Texas and includes the Chisos mountain range and a large swath of the Chihuahuan Desert. The area gets very little rainfall so don’t expect a lush scenery it is a desert landscape. In Texas you don’t have a lot of mountains and this is one of the few areas you can see them. The Chiso mountain range are some of the tallest mountains in Texas second only to the Guadalupe Mountains. The Santa Elena Canyon were carved out by the Rio Grande river with it soft limestone rock wall which allowed the waters to carve out a path downstream towards the gulf of mexico. 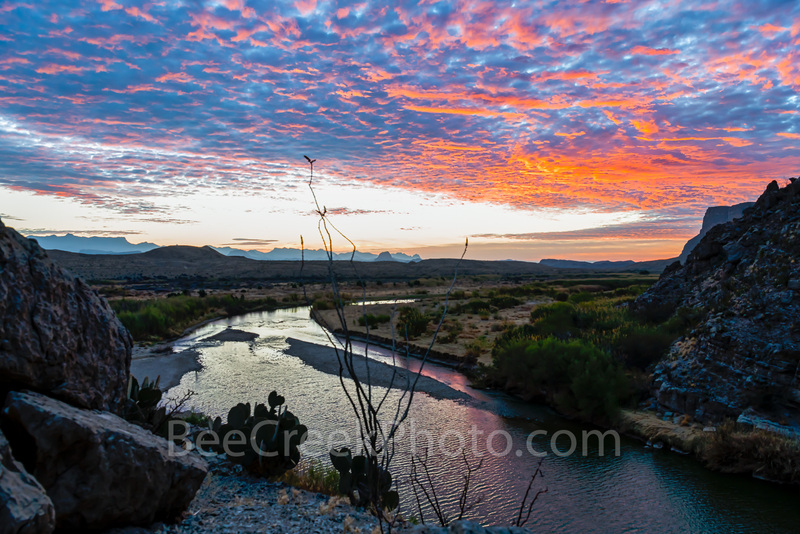 On this day the pre sunrise was spectacular with the colorful clouds over the Rio Grande river and Big Bend Landscape from this vantage point looking through the octillo along the limestone cliffs. Captured another great west Texas sunrise just before the sun pop over the nearby mountains from this vantage point in Santa Elena Canyon in Big Bend National Park. Even before sunrise it rewarded me with these beautiful colorful clouds over the west texas Rio Grande landscape from my vantage point in the Santa Elena Canyon. In this image you can see the colorful clouds through the octillo and prickly pear catus growing on the steep cliff of the canyon walls of this wonderful Texas landscape. You can see the Santa Elena Canyon from a pretty good distance in the park and it is the most impressive in Big Bend National Park. The Rio Grande changes direction abruptly after following beneath the Sierra Ponce cliffs for several miles heading west, cutting through the mountains via a deep, narrow gorge. It has national significance as the largest protected area of Chihuahuan Desert topography and ecology in the United States. Posted in Photo of the Day and tagged big bend, big bend national park, chisos mountains, clouds, colorful, down stream, gulf, landscape, Mexico, rays, Rio Grande river, Santa Elena Canyon, scenery, sunrise, texas, texas landscape on April 3, 2018 April 6, 2018 by Bee Creek Photo.